All fruit trees should be pruned late in the winter just before bud break. Pruning earlier can cause early blooming and late freeze damage. Ornamental trees are pretty easy to prune and we have done a newsletter on the subject in the past. See the newsletter archive on DirtDoctor.com. Pruning fruit trees should be done when the plants are dormant. 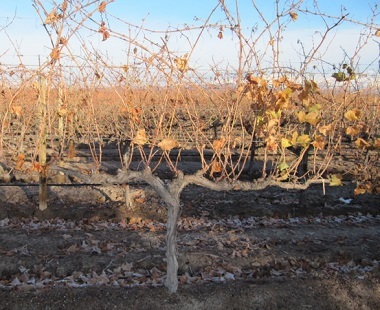 It's easier to see what you are doing and the removal of dormant buds invigorates the remaining buds. Summer pruning on the other hand removes leaves, slows fruit ripening, and exposes fruit to sunburn. Summer pruning can be used to slow down overly vigorous trees or trees that are too large. If used, it is most effective in early summer. Some people recommend severely pruning new trees at planting to short sticks 24 to 30 inches high saying that it encourages low branching and equalizes the top and root system. I don't recommend that. The little trees use their first burst of energy to try to grow back the part that has been cut away. competing branches growing straight up, and downward bending branches should be removed. It's best to do most of the pruning in the top of the tree so that the lower branches are exposed to sunlight. Make clean cuts (within 1/4") of buds. Upright branches generally remain vegetative and vigorous. Horizontal branches generally are more fruitful, but the best is to leave branches growing at 45 degree angles. Do not make flush cuts. Always preserve the branch collars. Tools should be cleaned in-between trees with hydrogen peroxide - not with bleach. Peaches, nectarines and grapes bear on last year's shoot growth so remove about 50% of last years' growth. For fig, olive, walnut, chestnut, pecan, almond, cherry, persimmon, apple, pear, plum and apricot which bear on spurs or less vigorous shoots, remove no more than 20% of last year's growth. For citrus, remove some tip growth so limbs don't get too heavy and break. Apples: Prune apple trees to create a scaffold branching structure with the limbs angling up at about 45% for best production. Thin the small developing fruit to be about 8" on center. Apricots: Remove dead, diseased, inward growing and crossing/rubbing limbs. Leave as much fruit as possible so you can at least get some of it before the wildlife does. Blackberries: Blackberries are very easy to grow but cutting the fruiting canes all the way to the ground after harvest is important for next year's crop. Other canes should be pruned to 36-48". Blueberries: Although needing little, they should be pruned in the late winter by cutting out the older canes and forcing new ones to develop from the base. 3-6 year old canes are the most productive. Excessively vigorous shoots should be removed. Keep the center of bushes open. Citrus: Instead of thinning citrus trees which leaves the fruit on long, thin branches leading to overload and breakage, cut the lateral growth in half and pinch back new growth several times during the summer to maintain compact growth. Elderberries: New canes grow from the ground each year. Two-year-old canes are the most productive. Old canes lose their vigor after 2 years and should be removed at ground level. Also dead, broken and other weak canes should be removed. Figs: Very little prunning is needed other than removal of dead branches. Grapes: They should be pruned in the dormant season as late as possible before bud break. Maturing grape vines produce far too much wood. 90% of it needs to be removed. Leave 3-4 buds per 12 inches of horizontal branches. There are several "training" methods that can be used. One of the most common is the low-wire cordon system where the vine is trained on wires to form a "T" at 3 feet off the ground on horizontal wire. Vertical canes are trained up from the horizontal arms to a 6 feet high wire. Kiwis: No clue. I have never grown them. Any advice would be appreciated. Mangoes: Ditto to Kiwis, but I do have experience climbing trees and stealing them in St. Thomas. Almost got electrocuted because there was a power line running though the tree. Someday I will do a newsletter on that story. Peaches: Prune to create an inverted tripod with three scaffold branches growing out at 45 degrees. Remove about 40-50% of the total branching including all gray two-year-old shoots. Fruit bears on one-year-old red shoots. Thin young fruit to 5-6 inches. Pears: No pruning has to be done. Some of the most productive trees I have seen are on old trees that have been ignored and even abused. If dong something would make you feel good, prune to create 45 degree angled limbs. Never remove any more than 20% of the healthy wood. Pecans: Prune out dead, dangerous and crossing/rubbing limbs. Low sweeping limbs should be left as much as is if possible in landscaping. It does not have much to do with pecan production, just the beauty of the tree. Commercial growers cannot usually do that. Plums: Prune to allow as many 45 degree angled limbs as possible and remove 20-30% of the total branching. Thin the fruit when young to 3-4 inches. Pomegranates: This is basically just a big bush that needs very little pruning other than that needed to keep the size under control. Removing their weak sucker growth at the base is a good idea. Walnuts: Not much pruning is needed. To be picky, lateral shoots that develop on branches often grow out upright at narrow angles and should be removed. Encourage new growth from buds growing more laterally that will produce stronger crotches that do not break in ice storms. Excellent book on this subject is The Berry Growers Companion by Barbara A. Bowling.